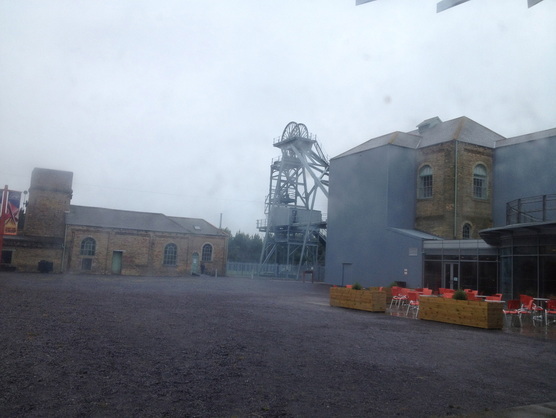 Woodhorn Colliery Route - Suscram. Turn right out of the back of school, turn left after Alexandra Park, follow the track to seven Oaks Park, passing the park and then turning right past the underpass, turn right after the traffic light into Smithy square, then pass the war memorial and cross the road following the cycle track, go down Parkside hill, continue following the cycle track to Burnside and through the underpass. At the fork in the path turn right continuing to follow the cycle track past Eastlea, stay on the cycle track until you cross the road into Northburn estate, keep going on the cycle track then turn left onto the road, you will go under the Main road and turn right at the roundabout past Boghouses, continue along the road then at the junction turn left then right, Follow the road past the three horse shoes pub ,when you come to the fork in the road turn left and past the gate, continue along the road until the garage which will be on the left. You have to turn right on the road and then take the second left not into the housing estate which is the first, Follow the road around the hairpin down to the river, Cross the bridge and take a Right then take another right off the road onto the cycle track Labelled route 1, Follow the track along then turn left before the signs for Cambois (Still following route 1) into Bedlington Station, Turn right and cross over the road at the lights towards East Sleekburn. 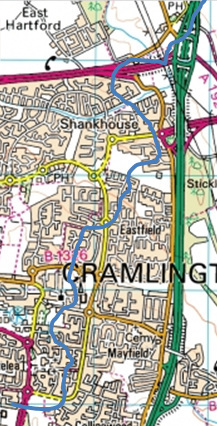 Cross over the spine road into East Sleekburn and continue to the next T-junction. 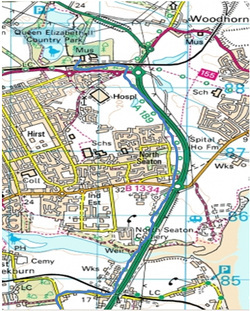 you can follow the route 1 signs round to Cambois, but if you want to cut off the loop and go a more direct route then turn left here and follow the road for a couple of miles until you see a right turn at the old primary school. take this turn and carry until you see the spine road above you. Cross the river and continue following route 1 until you get to the roundabout and continue with the signs for route 1, the track follows the road for a while then you will come to another roundabout that you must cross, and then turn right following the signs for Woodhorn museum, to return home reverse the route.